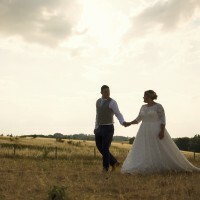 A plus size vintage-inspired wedding dress features allover lace with sheer lace comprising the three-quarter sleeves, boat neckline, and square back. Softly scalloped trim completes the unique glamour of this ballgown. Finished with covered buttons. I was able to comfortably eat, dance and drink! 1. I had the pockets on this dress removed 2. The dress was backless however I ordered more Cordeila lace (£150) to slightly fill in the back 3. I had all layers of tulle removed to make the dress more A Line shape rather than ballgown. In total the alterations cost £350. Once you send a message, Aimee can invite you to purchase the dress.